Jockey James Flores aboard Oklahoma Futurity(G2) winner Ec Revenge. OKLAHOMA CITY, OK— APRIL 10, 2019——With the first month of Remington Park's 2019 Quarter Horse meet completed, the glaring takeaway from the opening 30-days is the colossal start that veteran jockey James Flores is off too. Other than being at the top of the riders standings for Remington's 2019 Quarter Horse meet, Flores has seen victories in the Eastex Stakes (G2), Oklahoma Derby (G3), Speedhorse Graham Paint and Appaloosa Derby (G1), and the Oklahoma Futurity (G2). All four of these graded stake victories for Flores occurred on the same night (March 23), including two other day races to tally a six-win night for the talented young jockey. 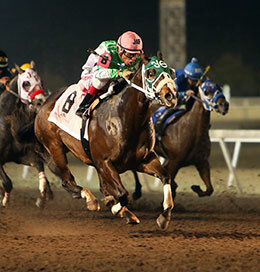 As the calendar moves into the month of April, the Oklahoma-bred two-year-olds have contested the trials for the Remington Park Oklahoma-Bred Futurity (RG1), with Flores successfully piloting the top-two qualifiers from the first night of trials. Flores was aboard the Gerald W. Reed trainee Lota Shakin Goin On to a decisive victory in his trial to register the fastest-time during the first night of trials for the graded-stakes event. The gelded-son of Lota Pyc was bred in the state of Oklahoma by Reed Land & Cattle Co., LLC. The second fastest-qualifier from the first night of trials was the Rick Robinson- trained Liarliar Hocksonfire, who is by one of the leading first-crop sires' Kiss My Hocks. Liarliar Hocksonfire was also ridden by Flores to victory in a time of :16.915. "My agent and I have been very blessed this meet thus far at Remington," said Flores. "It was a tremendous day we had to win six races in one-night in the meet on Oklahoma Futurity(G2) night, and we just hope to keep the momentum going into both the Remington Futurity(RG2) and the Remington Derby (RG3)." After the trials were contested this past Sunday for the Remington Derby(RG3), Flores's only mount of the day, Rick Robinson-trained Temptingsecretfly, a gelding by champion sire Tempting Dash, rolled to victory in the eighth and final trial race to qualify into the derby as the fifth-fastest qualifier. This coming summer, Flores is planning to make a shift to riding at Ruidoso full-time, as compared to the past summers that saw him ship in for trials and stakes events from his home-base of Oklahoma. Flores saw success in Ruidoso last year as he guided Political Attraction to a victory in the Rainbow Derby (G1). 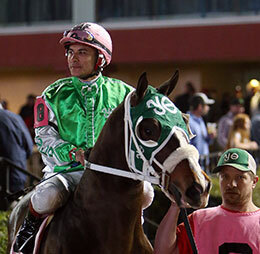 Through April 10th, Flores is the leading Quarter Horse rider in the nation in earnings with $581,356 from only ninety starts thus far in 2019. In 2018, he finished sixth in the nation in earnings with over $2.1 million earned from 441 mounts.